We used our Melissa and Doug Spin Art Machine which was a Christmas gift of mine! (Not Cassie's) It is a great little machine, but uses only 4x4 inch pieces of paper. It would be neat to try out all the different Spin Art machines and see which one is the best!!!! Do you have a favorite? 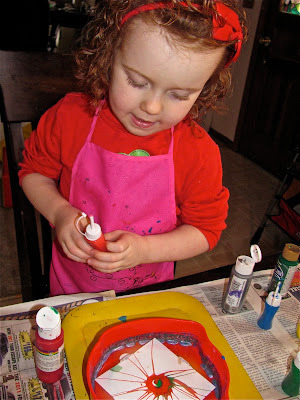 We used the paint that came with the machine and some watered down liquid acrylic paint. We had a wide variety to choose from. We tried adding paint while it was spinning. Fun! It is always amazing to watch and the best part is that it is different every time! We tried adding paint first and then spinning too! Both ways are fun! 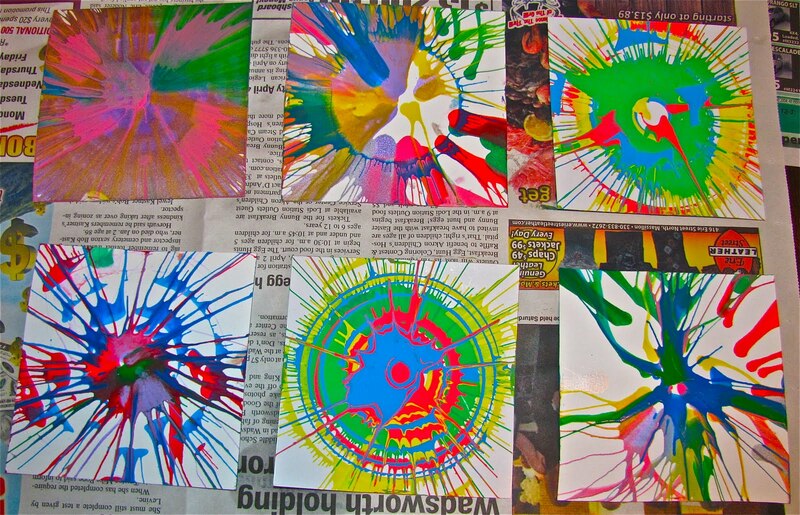 Here are our Spin Art masterpieces and then some! Aren't they FANTASTIC?? For Easter Egg Garland attach your eggs to yarn, string, or ribbon. We used tape on the back to attach the eggs to the yarn. They make a Gorgeous Easter decoration! Very unique too! You could also just attach each egg with a single string for an Easter Tree. I'm sure there are many possibilities! What have you created with Spin Art? this is a great idea! i love spin art, and easter eggs are perfect thing to put it on! Beautiful! I am always a sucker for spin art. We use a salad spinner! The colours so bright, and spin art looks like fun! Aaah so pretty so lovely!! We haven't made any spinart yet, but do want to have a go! Thanks for all your fab crafts on Kids Get Crafty this week! We use an old record player for spin art! These look lovely! Ohh - these are so cool. Fun and you can do anything in terms of color! Very cool!! Looks like lots of fun! I love that even little kids can do it! Super cute and colorful. Discovered your blog recently! Beautiful ideas. This spin art is absolutely gorgeous. I love the colors! These eggs are vibrant and beautiful! Love it!!! That looks like so much fun. We have to get us a spin art machine. My boys would go wild. Thanks for sharing. I'm teaching Joy School this next week and my theme is "Hoppy Easter" You just gave me an excellent craft idea with this post! Thank you, thank you!! FUN! 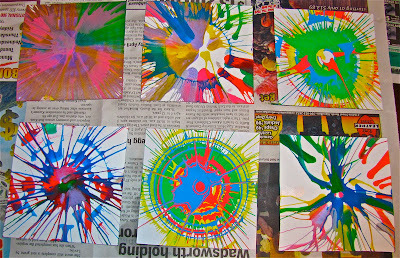 I like your various ideas that give painting a new "spin" on art projects :) Thanks! I love doing anything that involves mess and color. This puts a bright a funky spin on that ol Easter Rabbit look. I love Easter and this is right up our alley. i hope to get some done before this weekend, but if not i think we will do the hearts....Great stuff THANK YOU for posting such great projects! cool idea to make the eggs into garland! and you could do any shape for any holiday. bookmarking it now, thanks!